CRN ends the year on a high note! A few weeks after the presentation of the CRN 131 and the launch of the 58.2m motor yacht J'Ade, the yard prepares for the launch of the 80 metre superyacht Chopi Chopi. 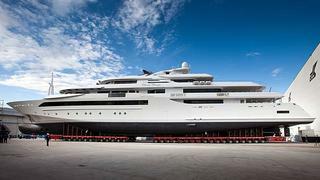 Until today, the 80m superyacht Chopi Chopi was only known under her hull number 129. This impressive vessel, designed by Studio Zuccon International Project with naval architecture by CRN, will become the new flagship of the Italian yard. Her interior, designed by Laura Sessa Romboli in collaboration with CRN, accommodates twelve guests in six cabins. The upper deck is dedicated to the owner's suite. The other double cabins are located forward on the main deck. The bridge deck is dedicated to lounges and a formal dining area. And crew and staff quarters are for a maximum of 30 members. Chopi Chopi is powered by twin 1,640kW Caterpillar engines giving a top speed of 16 knots, a cruising speed of 15 knots and a range of 6,000 nautical miles at 12 knots. Chopi Chopi was moved out of her shed earlier this week. Her mast was installed and then she was moved onto the inclined slipway. It is from here that Chopi Chopi will be launched on January 12th, during a big event organised by the yard.